UNCTAD data show that, in 2014, 37 countries and economies adopted at least 63 policy measures affecting foreign investment. Of these measures, 47 related to liberalization, promotion and facilitation of investment, while 9 introduced new restrictions or regulations on investment (the remaining 7 measures are of a neutral nature). 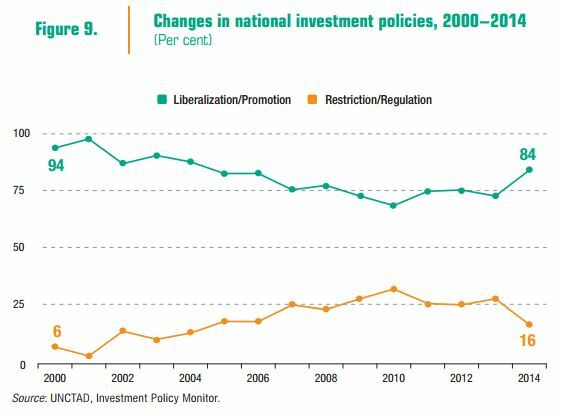 The share of liberalization and promotion increased significantly, from 73 per cent in 2013 to 84 per cent in 2014 (figure 9). A number of countries introduced or amended their investment laws or guidelines to grant new investment incentives or to facilitate investment procedures. Several countries relaxed restrictions on foreign ownership limitations or opened up new business activities to foreign investment (e.g. in infrastructure and services). Newly introduced investment restrictions or regulations related mainly to national security considerations and strategic sectors (such as transport, energy and defense). The share of policy measures related to sustainable development among all reported investment policy measures between 2010 and 2014 is relatively small (approximately 8 per cent). Most of those measures were specifically aimed at increasing private sector participation in key sustainable development sectors (infrastructure, health, education, climate change mitigation). Countries should enhance their investment facilitation efforts to channel more investment into sectors that are particularly important for sustainable development. At the same time, they need to put in place a sound regulatory framework that seeks to maximize positive development impacts of investment and to minimize associated risks by safeguarding public interests in these politically sensitive sectors. 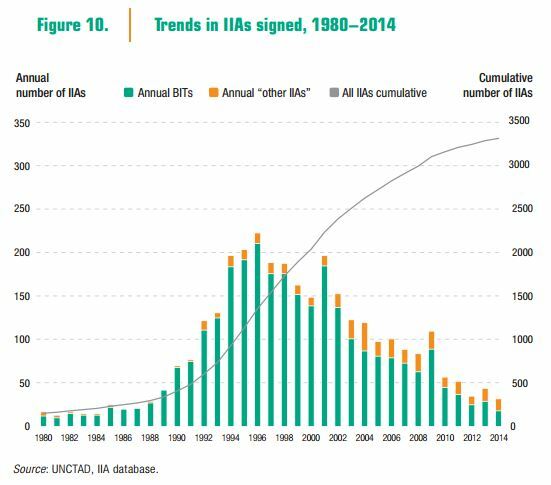 With the addition of 31 international investment agreements (IIAs), the IIA regime had grown to 3,271 treaties (2,926 BITs and 345 “other IIAs”) by the end of 2014 (figure 10). Most active in concluding IIAs in 2014 were Canada (seven), Colombia, Côte d’Ivoire, and the European Union (EU) (three each). Overall, while the annual number of BITs continues to decline, more and more countries are engaged in IIA negotiations at regional and subregional levels. For example, the five ongoing efforts in the TPP, TTIP, RCEP, Tripartite and PACER Plus negotiations involve close to 90 countries. 2014 also saw the conclusion of 84 double taxation treaties (DTTs). These treaties govern the fiscal treatment of cross-border investment operations between host and home states. The network of DTTs and BITs grew together, and there are now over 3,000 DTTs in force worldwide. BIT and DTT networks largely overlap; two thirds of BIT relationships are also covered by a DTT. An increasing number of countries and regions are reviewing their model IIAs in line with recent developments in international investment law. This trend is not limited to a specific group of countries or region but involves countries in Africa (where 12 countries are reviewing their models), Europe and North America (10), Latin America (8), and Asia (7), and 6 economies in transition, as well as at least 4 regional organizations. South Africa and Indonesia continued their treaty terminations, while formulating new IIA strategies. Brazil, India and Indonesia revealed their novel approaches at the UNCTAD Expert Meeting on the Transformation of the IIA Regime, held in February 2015. This was followed by the EU (with a concept paper) and Norway (with a new model BIT) in May 2015. These new approaches converge in their attempt to modernize IIAs and further improve their sustainable development dimension. UNCTAD’s Investment Policy Framework, which represents a new generation of investment policies, has been widely used as a main reference in the above processes. Most of the agreements reviewed include at least one provision geared towards safeguarding the right to regulate for the public interest, including sustainable development objectives, as contained in UNCTAD’s Investment Policy Framework. This includes general exceptions, clarifications to key protection standards, clauses that explicitly recognize that the parties should not relax health, safety or environmental standards in order to attract investment; limits on treaty scope; and more detailed ISDS provisions. Although relatively few in number (228), IIAs with “pre-establishment” commitments, extending the national treatment and MFN obligations to the “establishment, acquisition and expansion” of investments, are on the rise. Most involve a developed economy: the United States, Canada, Finland, Japan, and the EU. Also, a few developing countries in Asia and Latin America have been concluding pre-establishment IIAs, including Chile, Costa Rica, the Republic of Korea, Peru and Singapore. When including pre-establishment commitments in IIAs, safeguarding the right to regulate calls for the use of reservations and safety valves. 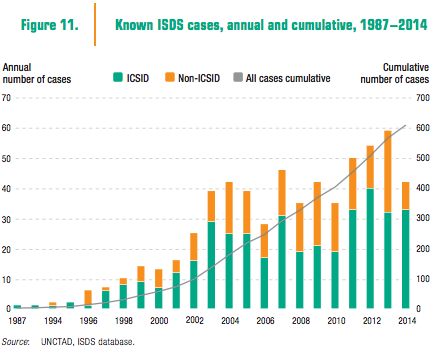 In 2014, investors initiated 42 known ISDS cases pursuant to IIAs. Last year’s developments brought the overall number of known ISDS claims to 608 (figure 11), lodged against 99 governments worldwide. Some 40 per cent of new cases were lodged against developed countries. In 2014, the number of concluded cases reached 405. States won 36 per cent of cases (144), and investors 27 per cent (111). The remainder was either settled or discontinued.